In science communication, as in other forms of communicating, images often help tell a story in ways that text alone cannot. Reporters surveyed by EurekAlert! in 2017 said that graphics and photographs are the most useful multimedia formats in their newsgathering, and our website traffic analytics show that news releases with multimedia, compared with those without, are more likely to become “trending” on EurekAlert!. Click here to download a PDF copy of EurekAlert!’s multimedia licenses and permissions guide for PIOs. PIOs have long known that good art makes news releases more appealing to readers; a stunning image can capture the eye and instantly draw in your audience or set your news content apart in a crowded information marketplace. Through our 2014 redesign, EurekAlert! aimed to become a more multimedia-friendly platform and we encourage PIOs to submit images and videos to accompany their news releases, or as a stand-alone contribution to our Multimedia Gallery. While it is easy to grab an image from a Google search and plug it into a news release, there are certain important legalities to be cognizant of when sourcing images in the context of media relations, especially when they are submitted to EurekAlert!. As a news wire service, content on EurekAlert! is first and foremost made available to the news media for reporting or aggregation. As such, if a piece of multimedia appears on EurekAlert!, reporters and editors assume it is cleared for reuse or redistribution without further need to obtain permissions. It is therefore crucial that PIOs understand the licensing terms associated with each piece of multimedia they post on EurekAlert!, and whether its meets EurekAlert!’s requirements. By being mindful of the differences in licensing terms, PIOs can avoid inadvertent misuse and, in the worst and costliest cases, copyright infringement. In this post, I will parse out the top considerations of multimedia licensing that PIOs should remember when sourcing and submitting multimedia to EurekAlert!, and a quick overview of how to include all the pertinent information with your multimedia submissions. Stock providers, like Adobe Stock and Getty, specialize in photography and other multimedia that users obtain by purchasing a license. The license lays out the conditions governing how the stock multimedia assets can be used. Most licenses that stock providers offer fall under two categories: standard or extended. Standard licenses grant the purchaser rights to use the stock content in most media formats (e.g., web, print) as part of marketing, web and graphic design, packaging, and publishing projects. Extended licenses come with the same terms as standard licenses, but with the additional permission to use the stock content on products offered for sale. The crucial feature of any stock license is it that is not transferable, which means that the license holder – in our context, your institution – may only use purchased stock multimedia on properties or projects they own (i.e., your institutional websites). Since the EurekAlert! website is a separate entity, stock multimedia purchased with a standard or extended license cannot be submitted to EurekAlert! due to the license’s non-transferability. Stock multimedia is also problematic as an accompaniment to news releases submitted to EurekAlert! because the chief purpose of our service is to supply reporters with content they can reuse for news reporting. Section five of our submission terms and conditions explains it in “legalese,” but the gist is this: the submitting institution retains ownership of submitted multimedia, but by submitting multimedia to EurekAlert!, PIOs (on behalf of their organizations) grant EurekAlert! unrestricted permission to use, display, and distribute that multimedia. This permission allows reporters, members of the public, and anyone else who could feasibly obtain multimedia from the EurekAlert! website to use it as long as they comply with the usage restrictions you have specified for that content. The main takeaway is purchased stock multimedia should not be submitted to EurekAlert! due to the practical conflict between our platform as a reporting resource and the non-transferability requirement that is standard in stock licenses. There are six Creative Commons licenses, plus CC0 which is for works whose copyright has been waived. Each Creative Commons license stipulates, in plain language, how the creator of the work must be credited (if at all), and how the work itself may be distributed, altered, and for what purposes it may be used. These types of images may accompany your news releases for illustration purposes (e.g., to convey the subject matter of the news release). Multimedia submitted to EurekAlert! with a Creative Commons license should include the name of the license in the usage restrictions field, as well as the credit information required by the license. Pixabay, Pexels, and Unsplash are a few of the many services that have stock multimedia available for free, and you’re allowed to use it for marketing, websites, printed material, and more, with credit to the original artist optional but preferred. However, assets sourced from royalty-free providers are created by third-parties and may come with certain usage restrictions. These restrictions vary depending on the individual site, but the most common rules consistent across royalty-free sites are: don’t use the royalty-free stock content to offend or degrade anyone depicted in it, don’t use it to imply endorsement, and don’t resell it. EurekAlert! accepts royalty-free stock multimedia as long as attribution to the original author of the work and the name of the stock image provider are included – if any of this information is missing, we will request that you provide it; otherwise, we cannot accept the image. It is incumbent on PIOs to read the free stock provider’s policies to make sure they permit nonexclusive, transferrable usage. If you’re not sure, leave it out, or email us for help. There’s a trove of multimedia considered to be in the public domain, ranging from classic works of art like the Mona Lisa, to satellite photos of distant galaxies and colorful nebulae captured by the Hubble Space Telescope. Works whose copyright has expired are also considered public domain, as well as original multimedia produced by taxpayer-funded programs and agencies under the US government. Usage terms for works created by public institutions in other countries should be carefully researched, and not assumed to follow the same rules as the United States. 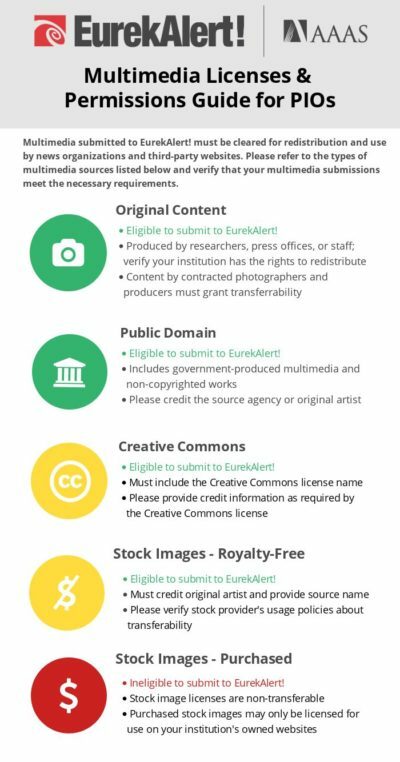 Public domain multimedia is eligible for submission to EurekAlert! without any restrictions. However, it is good practice to include source credit and/or a reference to the original creator as a matter of professional courtesy. None of this is to say that multimedia from these sources should be automatically assumed to be public domain and free of copyrights. While multimedia produced by a government agency cannot be copyrighted, it’s possible that the piece is owned or licensed to a government agency and, therefore, is subject to the original, non-federal creator’s copyright and licensing restrictions. Always check to make certain that the content is truly in the public domain, and remember that a piece of multimedia derived from a public domain piece might also be under copyright. The easiest way to ensure that you own the rights to multimedia is by working with original content produced by the research team, your own team, or institution staff (e.g., a university photographer). Many organizations have universal photo release forms which grant the organization unlimited use, including as handouts to news organizations. Check with your institution’s legal office to see if one is available. If you or the research team hire a contract photographer or multimedia producer to create content about a project, ensure that the contract includes transferability so that the larger organization (e.g., the university) and third-parties (e.g., the media) can use those assets. Again, many organizations have standard contract templates that cover these provisions, and may save you time and heartache when copyright infringement lawyers come calling about the breathtaking image that has appeared on news sites around the world. How to submit multimedia to EurekAlert! PIOs can submit multimedia to EurekAlert! in two ways: as part of a news release or as standalone content. As part of a news release, PIOs can attach up to three pieces of multimedia. The multimedia can be images, videos, or audio clips in any combination. Page 5 of the news release submission form is where multimedia gets attached, if you so choose. To submit a standalone multimedia item, PIOs select the multimedia type (image, video, audio) from the list provided near the bottom of the main submissions page. Title – a “headline” that describes the multimedia. Avoid using words like “Figure” or “Photo” as the title. Caption – a description of the multimedia written in complete sentences. Credit – the name of the creator, source, and/or copyright owner. A URL to the original source can go here, too. Usage restrictions – a statement declaring how the multimedia can/cannot be used. Include the name and link to a Creative Commons license here, if applicable. Unless otherwise requested, release and standalone multimedia appear in EurekAlert!’s multimedia gallery. A few exceptions are headshots, journal or report covers, and logos – these can appear in news releases, but are excluded from the gallery. Have you encountered challenges with multimedia licenses? What steps do you take to balance the artist’s copyrights and your need to promote your content? Continue the conversation and share tips in the EurekAlert! PIO Forum. Not part of the PIO Forum yet? Email pio@eurekalert.org for an invitation.